It's me...Emily...here with my very first tutorial for Designer Blogs. First off, I just have to say how excited, nay, ecstatic I am to be here! What a fun group of gals I get to work with. Today we are going to talk about customizing your title fonts in Blogger if you don't yet have a custom blog designed by us. It's nice to be able to change even the smallest of things on your blog to more closely match your personal style, but changing things up on your blog by yourself can be intimidating at best. When I first started my blog I was terrified to change anything in fear that my computer might self-destruct - or worse - actually start pointing and laughing at me. But the good news is, Blogger has made some changes recently that make this pretty easy. And just in case you didn't know, they have actually added about a zillion new fonts to make your blog even more unique to your personal style. 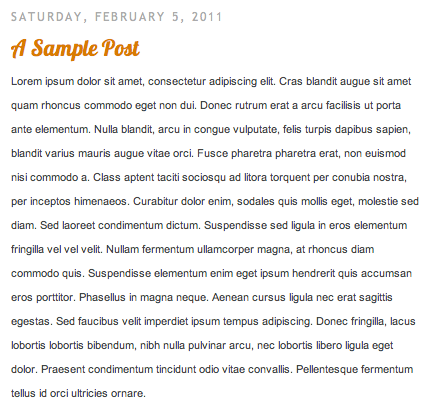 *Note: if you have already a custom blog designed by Designer Blogs, your custom fonts may override this process. (But in this case, you probably already have exactly what you want and don't need to mess with anything). Here is your basic blog post as it appears in Blogger if you haven't changed anything on your blog. To make your changes, you will login to Blogger and head over to your Design tab. Under Design, you will click on the Template Designer. This is what your Template Designer looks like. As you can see, there are quite a few buttons to click on to customize your blog. Go ahead and play around with these a bit without being scared because nothing here gets saved unless you actually save your changes. For today's tutorial, you will click on the Advanced tab and then scroll down until you get to the Text Font. Click on Text Font and it will bring up a dialogue section where you will see several different fonts, as well as the options to make them BOLD, italicized and then to be able to change the font size. I scrolled down and picked the Lobster font and then changed my font size to 120% of its normal size. Once you have decided on a font and everything is looking the way you'd like in the preview box, go ahead and click Apply To Blog. Go ahead, don't be scared. 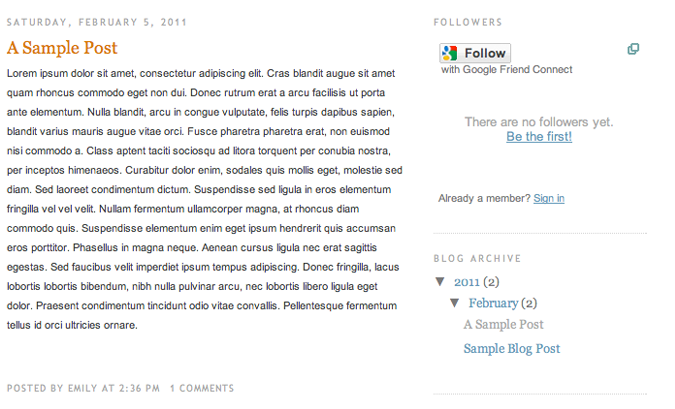 Your new Title Font now appears on your front blog page. And then you smile because it's so cute and for a second, all is right with the world. Alright - now go and pretty up your blog!! Hi Tia! Depending on the template you are using the options for the fonts might be a little different, try seeing if there is a "Post title font" category and that should change just the post title. Let us know if that doesn't work...thanks!